SACRAMENTO, Calif. (Reuters) - California's first gray wolf pack since wild wolves disappeared from the state nearly a century ago was spotted in the woods in the northern part of the state, wildlife officials said on Thursday. The pack appears to include a wolf photographed by state fish and wildlife experts last month, then believed to be alone. "This news is exciting for California," Charlton H. Bonham, director of the Department of Fish and Wildlife, said in a statement. "We knew wolves would eventually return home to the state, and it appears now is the time." Officials said the pups appear to be a few months old. 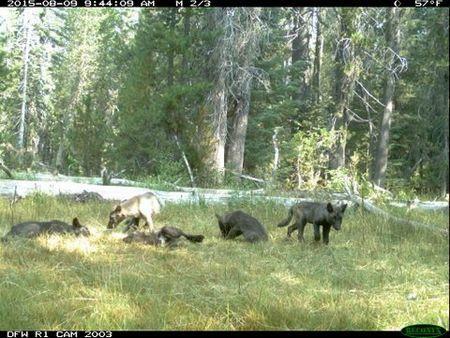 Officials learned of their existence thanks to cameras posted in remote parts of Siskiyou County near Mount Shasta, which snapped images of the pups and adults, the statement said. Officials have named the group the Shasta Pack. In May, nearby cameras captured images of a large, dark-colored animal experts thought might be a gray wolf. Then in June, researchers studying deer in the area found tracks believed to be from a wolf or dog and posted additional cameras to see what they could spot. Images showed an adult wolf, and experts initially believed there was only one. It was not, they said, a wolf that had earlier wandered into the state, dubbed OR7 by scientists. That wolf has not been in California for more than a year and is currently the breeding male of a pack in southern Oregon. Gray wolves, which were hunted to the brink of extinction throughout the western United States, are protected in California under the federal government's Endangered Species Act, and are very gradually beginning to return. The last confirmed gray wolf sighting in California was in 1924, officials said. The presence of the small pack near Mount Shasta could mean that wolves in California, like their cousins in Oregon, may make a comeback. Earlier this year, officials in Oregon said that the possibility of new pups in OR7's pack came on the heels of research showing a total of 77 wolves in the state a the end of 2014. The Oregon Fish and Wildlife Commission will consider removing state endangered species protections for some gray wolves at meetings scheduled for the fall.